Happy weekend to you all, I'm pretty sure that most of us are already familiar with MTN double data bonus. It is one of the oldest MTN data offer, accomplish through IMEI tweaking, which many people have benefited from while some of the guys like me still enjoy the offer up till this moment. Good news guys, another method has been discovered on how to get 100% data bonus without changing your IMEI. This means that everybody can benefit from this new MTN 100% data offer. Those using phones that are very stubborn to tweak and those having the fear of bricking/losing their phone warrant when changed the original imei can benefit from this offer. Blackberry, Windows phone and iOS users can as well benefit from this new offer. To acquire this new 100% data offer, the process won't require you having an MTK device, rooted device neither downloads MTK engineering mode. All you need is sending a particular USSD code. Follow the steps below to get it done. You will receive three messages from MTN. First message: "Your request has been received"
Second message: "You have sent an invalid command"
Third message: "Dear Customer, enjoy Data offers on MTN Deal Zone, Dial *131*1#"
After receiving the third message, you can then purchase the data plan of your choice by dialing*131*1# and enjoy your double data bonus. 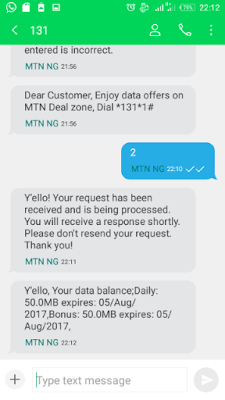 NOTE: The third message is the determinant showing that your SIM has been activated for the offer. If you do not receive the third message or what you receive is contrary to the third message above, retry the method again. If after retrying, you do not receive the third message, it means Your SIM is not eligible, so don’t waste your money in subscribing. Once you receive the third message, you can start with small data plans such as the 50mb for N100 and check the balance, if the bonus is there, you can proceed with other higher plans. To check your data and bonus data balance text2 to 131. Don't forget to drop your testimony, if the method works for you. And remember to use the share buttons for the benefit of others.